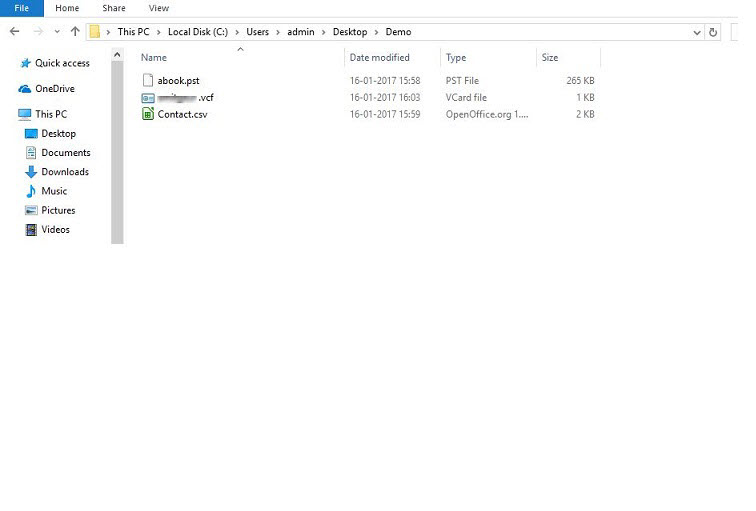 This tool converts the Mozilla Thunderbird Address Book file i.e abook.mab, history.mab or impab.mab (imported Address Book) to PST (Outlook Data file). This PST file can be saved at any specified location. The software can be opened in two view mode- Vertical or Horizontal Users can switch the screen view mode any time, the content display will be same for both. MAB file can be converted to .vcf file and can be saved at any browsed location. 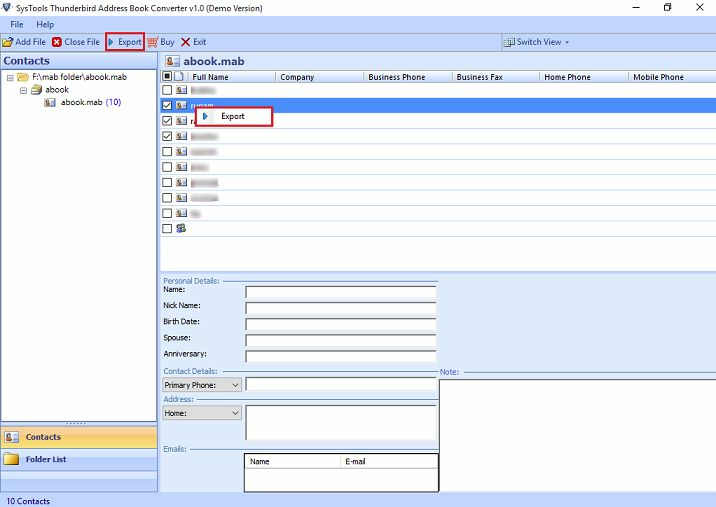 Each contact will have different vcf file with all details of that particular contact. This product creates the vcf file of vCard version 2.1. 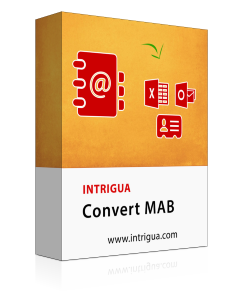 This tool supports to convert MAB file to CSV format which can be viewed and opened in Excel sheet or in any other application supported to CSV format. It transfers all type of MAB file including history.mab and abook.mab file into CSV format. This tool export the MAB file to PST format without Outlook Installation in the system by default. But it has a option Use Outlook select it only if MS Outlook is installed in the machine. 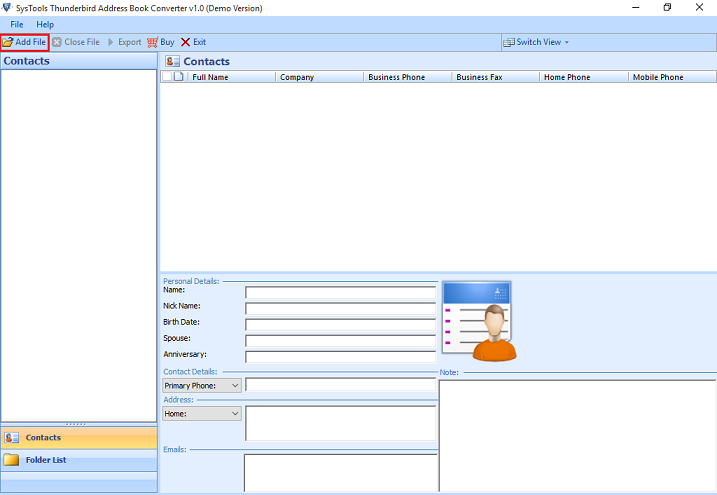 The software provide preview of Contact details before going to exporting process. Personal Details (Name, DoB etc), Contact Details(Mobile no), Address and Emails is shown in Preview. There are two .mab file extensions, one for Mozilla Address book and other is for Markaby html script file. Here we are considering the Address Book format .mab file. MAB file contains the Contacts Information like Names, Phone Number, email Id, Address etc used to manage personal and Business Contacts. .mab file is supported to all mail applications of Mozilla like Thunderbird, SeaMonkey, NetScape etc. Thunderbird consists of three types of MAB file :abook.mab(save personal address book), history.mab(save Collected Address book) and impab.mab(save imported Address book). What is the need to Convert MAB file? MAB file can be accessed only by Mail Applications of Mozilla. 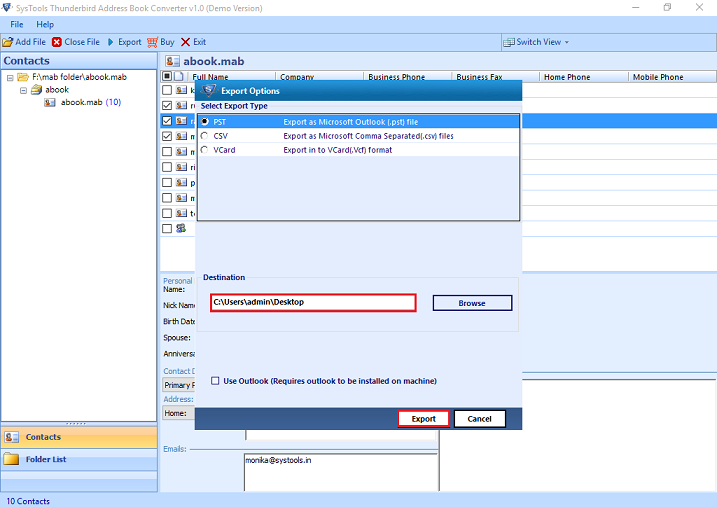 So the users need to access their Address Book in Outlook is unable to do so. This is the reason why they need to convert MAB into PST file. MAB can be converted to CSV file which can be viewed and saved in excel format so it is more GUI friendly. Step 2: Export selected MAB file. Step 3: Choose the format to convert MAB file. This video shows the entire features of Convert MAB tool. User can easily understand the working of tool and how to run and use this software by watching the below given video. Does this tool converts impab.mab file also? Yes, impab.mab file can be converted to .pst, .csv, or .vcf file format using this software. Is there any data size specification for this tool which can be exported? No, you can export any size of MAB file there is no such limitations. Can I use this tool in Windows 8? Yes this tool is supported by all versions of Windows. In which file format MAB file can be converted by using this utility? MAB file can be converted to PST, CSV or VCF format. You can choose any one of them for conversion. Can I try Convert MAB before purchasing? Yes we have provided the demo version of this software for complete user satisfaction, it will export only 25 items of MAB file. So you can use it before buying full version of product. 1GHz Processor is necessary but it recommended to have 2.4GHz. Minimum 512MB RAM is Required (it is recommended to have 2GB RAM). Atleast 25MB of free Hard Disk space is required. to run the tool. This tool Supports to Window 10 and all below versions. I have used this software and converted my Mozilla Thunderbird account MAB file to PST file format which is supported to all versions of Outlook. I imported PST to MS Outlook 2016 and I get all contact lists of MAB file into it. It had a great experience to use this tool. I will suggest others also to use it. I really needed a software which could exports Thunderbird history.mab file to vCard Address Book file and CSV file. I found out this tool which has all the features. Now I can access my contact list details in any Application supported to .vcf and .csv file. Thanks to the Development team who developed the Intrigua Convert Mab.